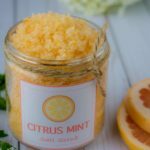 This DIY Citrus Mint Salt Scrub with grapefruit and peppermint essential oil is invigorating and moisturizing for your skin. Add all ingredients to a large stainless steel or glass bowl. Mix until well combined. I rubbed the zest between my finger tips to release some of the color to give the scrub a pretty orange hue. Print labels according to your printer instructions using the template included in the link. In order to make your labels waterproof, you can cover the entire label sheet with a one sided laminated sheet. For the “Scrappy Version”, you can cut out the label and cover with a piece of packing tape and cut around the edges. Add the scrub ingredients to a jar and enjoy or give as a gift. This scrub can be used as a body scrub and is great for sore feet.